The 2011 round of the Good Food and Wine Shows opened in Melbourne last weekend, showcasing some of the country’s best producers and their quality wares. Melbourne foodies and I flocked to the venue from 10am to sample, taste, discover, and judging by the amount of wheelie shopping bags around, shop for some good, show-only bargains. As a passionate foodie, I visited the show to get a preview of what’s coming to Sydney in July. As a wholesome cook and an avid label-reader, I visisted the show to look for new developments in the natural snackfoods and basic pantry staple range. I was after low or no additives, natural ingredients, low or no added sugar and little saturated fat. One condition: they needed to taste awesome, not just good. The reason for this is that many of those products are ‘traditionally’ highly processed and additive-laden, yet they are an easy choice to fill up kids’ lunch boxes and often end up as snacks on our own tables. Why not reach for the better options when they are just as easy to get and just as affordable? Up for grabs is a 6 pack of Tucker’s Natural cracker selection, courtesy of Sam Tucker and his company, Tucker’s Natural. The prize consists of 1x savoury crackers in poppy seed, 1x savoury crackers in rosemary and rocksalt, 1x dessert crackers in vanilla, 1x dessert crackers in chocolate, 1x multifibre crackers in capsicum and feta + 1x pack of your choice from the entire selection. To enter simply leave a comment on this post. Entries close Sunday, 19 June, 2011 at midnight AEST. A random comment will be drawn on Monday, 20 June, 2011 and the winner notified soon after by email. You don’t often come across crackers that are preservative, MSG and other additive free, yet they taste so delicious. 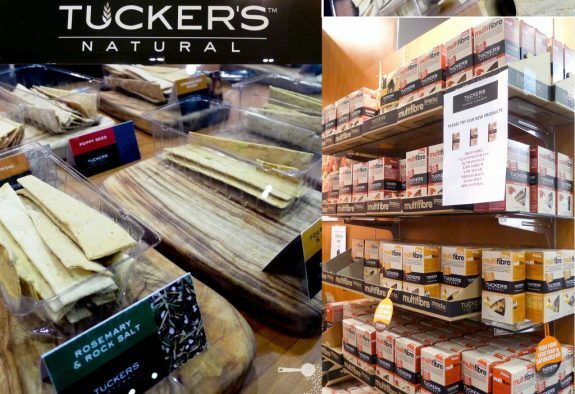 Tucker’s Natural crackers taste great because only the best fresh, natural ingredients and traditional hand-made methods are used in their production. On top of the original cracker range the offering includes two more irresistible products: one savoury and one sweet. The savoury Multifibre cracker contains both soluble and insoluble fibre to help cleanse the digestive system, while you get to enjoy the crunchy texture in one of the three tasty new flavours: capsicum and feta, tomato and basil, caramelised onion and cheddar. The crackers are big enough to use with dips – a perfect, healthier option for parties or just a night in. The sweet dessert crackers, I hope to have your attention now, comes in Vanilla, Chocolate, Honey and Coffee. Subtly sweet so as not to detract from your favourite topping, yet delicious enough to eat as a healthier natural snack on their own. Think light dessert or as a healthy alternative to commercially made biscuits for the kids’ afternoon tea. I would even go as far as topping my Vanilla cracker with goat’s cheese and dried sour cherries, can you imagine? Pure deliciousness. 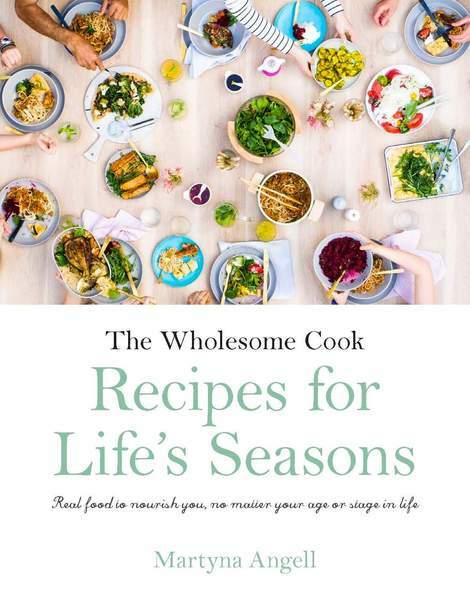 Available from Coles, Woolworths, IGA, Costco, David Jones, Thomas Dux and other stockists. I’ve discovered Anathoth jam at last year’s GFWS actually. A little pottle of their Boysenberry jam was included in one of the showbags I picked up. It was all that a jam should be: sweet, lightly tart, just set and all the little bits of the fruit were in it. None of that uniform, jelly-set stuff that you get from other brands. It smelt like the fruit it was made from. Gorgeous, and not just on bread. I even used it to accompany a savoury dish: my chicken, brie and pistachio parcels. When I saw the stand I had to take a closer peek. In addition to a good range of jams – Rhubarb and red berry might just be my new favourite, Anathoth has recently launched a new range of all natural chutneys. They include a Tomato Relish, Farmstyle Pickle & Zucchini Pickle and are gorgeous as well. Now the other best thing about the product is that it is very affordable: a 475g pottle of jam costs $3.99. Try it and you won’t want to go back. Available from Coles and Woolworths. I’ve always been a big fan of the Go Natural snack nut bar range because it’s full of natural ingredients and flavours, so much so you can taste the difference. Now, you will appreciate how excited I was when I heard the company was going one better: their new No Numbers range has completely eliminated the use of any ingredient that has a number in its name (think preservatives, additives, antioxidants). One of the new products, which I will definitely be finding a lot more in my snackbox, is the minimalist fruitnut bar which is very similar in concept to the Lärabar. My favourite? 4 ingredients: dates, coconut, cocoa, almonds. That’s it. How good is that? Marvellous, if you ask me. Mix My Muesli is Australia’s first custom-made muesli service. There is no added sugar and most ingredients are additive free. You simply go on the website and start mixing, adding those ingredients you love and leave ones the ones you hate. Not a big fan of dried pineapple, but love your young coconut? Why not add double? The company also offers a range of pre-mixed muesli packs. Your muesli comes in a sleek, air-tight container, and for an extra charge you can even create your custom label and have your muesli custom-named. The website remembers your choices so re-ordering is easy. Available online plus $3.99 postage anywhere in Australia, but if you live in Melbourne you can pick up pre-mixed packs from various stockists around town. The bottle has been designed from 100% recyclable materials and is completely BPA, PVC and phthalates free, making it one of the safest bottles on the market. Both for your health and the environment as a single filter is able to purify an equivalent of 300 plastic drink bottles. There are a number of sizes and colour options to choose from, from small kids versions to 1litre bottles that you can keep on your desk, keeping you hydrated on pure fresh water all day long. And they are really, very affordable. The popular 550ml / 18.5oz size bobble water bottle retails for A$14.95. If you’ve missed out on the Melbourne show, do not despair the show is coming to Sydney, Perth, Adelaide and Brisbane over the coming months so if you plan ahead you can still make it – click on your city’s name for a full program and to buy tickets. Each show will be slightly different, focussing on showcasing producers of the respective regions. Ine of the highlights of the Sydney GFWS (July 1-3), for exanple, will be hands on chocolate making classes by Adora Chocolates and butchery classes by none other than Victor Churchill. But get your tickets early – they will sell out. yeah. what a brilliant write up. I visited all these booths last year. I’m so excited to go with it comes here. I’d love to win your giveaway, the product sounds interesting & not to mention tasty. The vanilla crackers are my favourites – so much better for you than biscuits! Great for ice cream too! Tucker’s natural crackers sound so good! Hi Martyna! The show is coming to Sydney? Good, ‘coz I’d like to get my hands on a few jars of Anathoth jams. I tried them once, had trouble finding more. Nice! Looking forward to visiting Sydney’s next month. Hope there are bobbles, they have caught my attention. They are a great concept, we buy bottled water all the time but it’s time to make the switch. Yay, I’m going to have a tour guide for the Sydney show who has done all the recon for me. Excellent. I like the look of the jams, but I know The Boy would go potty for those honey crackers – he’s a honey fiend. It will be my pleasure to take you around. All these products are great! And I hope for more pickles and sauerkraut in Sydney to add to my list. Great post – it’s made me think I definitely need to go to the Sydney one! I’m so glad you posted this, because I completely forgot GFWS was on! Luckily, Sydney are still selling tix 🙂 Need to get one of those water bottles, I drink more than a fish, lol. Ticket sales should be fine till closer to the event, it’s the classes that may sell out, so be quick if you want to attend one of them. PS water is good for you. I used to go to the Melbourne show and now that I’m on the Sunshine Coast I miss it. I will definitely be going to the Brisbane show but that’s not til November I think. Your jam selection looks yummy. I read rhubarb and red berry jam and started to salivate. Thanks Maureen, definitely worth getting down to Brissy for the show! You can get the jams from the supermarkets – I’m hoping to post some recipes soon featuring some of the products, including the jam! I’m always on the lookout for nutritious food ideas that are full of flavour and are healthy for you. Recently I came across Go Natural food bars which I can’t get enough of. Ideal for a mid morning snack and full of flavour. GFWS is coming to Brisbane in November and I look forward to checking out Tucker’s Natural stand amongst others. I would love to win the prize of Tucker’s Natural Crackers selection and try them out at my next party. Good luck Christina and have fun at the show! If you discover any other goodies worth mentioning, please let me know! I am desperately looking forward to the brisbane show in November. I was so bummed to miss the Melbourne one. To many things going on. Maybe next year! Last year tthe Tuckers stall was my most visited stall of the show. Seriously. I couldn’t stop coming back to sample more (or repeated) flavours. I’d be thrilled if I win the prize! They are great aren’t they?? Good luck! Are you attending this year? These crackers sound great, and I love crackers. Good luck to all. I would be thrilled to win the crackers. Thanks for the contest. This is an awesome giveaway. I would love to try these products!! Great reviews! The crackers sound delicious, I would love a chance to try them! Good luck ladies, I’m glad you love the product. I’ve never heard of dessert crackers–what a fun idea! Wow, all of these look incredible! I’d like to try them all! Thanks for holding such an exciting giveaway! Wow! These sound D-lish. Thanks so much to both. they all look so amazing! thanks!! those jams look super yummy! Yum.. Great write up and a great product.